I was in third grade. It was a Sunday morning, and I was sitting in our children’s church room at church when our children’s leaders were suddenly called away from the classroom. They left a boy and a girl in charge – no more than two years older than myself – who were instructed to ensure that no one talked or made noise while the leaders were gone. If someone spoke the interim leaders were to write those names down. Being a person who always wanted to please and had this inborn trait of following the rules, I sat in my chair determined to keep my mouth shut, until the person next to me whispered something to me. 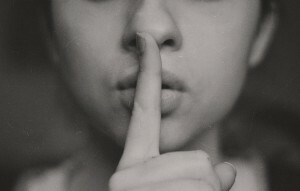 Some of my memories are a bit fuzzy in regards to the interaction that followed, but I seemingly remember responding with, “Shhhh…no talking.” One of the child leaders snapped at me, “Amy, stop talking!” Followed by marking my name on a list. I couldn’t believe it. I was angered. I wasn’t talking and disrupting. I was trying to do the right thing. I was stopping a conversation from proceeding. How could I possibly be in trouble for saying, “Shhhh”? I was beside myself with indignation, and I spoke up. I refused to be falsely accused, and I said with conviction, “I wasn’t talking.” To which the incapable leaders responded, “You’re talking now.” And they added a mark next to my name. I couldn’t believe myself. I pushed back, “I wasn’t talking. And just now I was trying to explain to you what was happening. This isn’t right!” Followed, again, by a mark placed next to my name and a, “You are talking right now. You need to stop talking.” I can not even begin to articulate the absolute frustration that filled my entire body. This was unjust. I was being treated unjustly, and there was no one there to stand up for me and stop the injustice; just a room full of elementary aged children held hostage by incapable and immature leaders. Eventually church ended and parents began picking kids up. Noise from the hallway filtered into our meeting room, and the order of the classroom disintegrated into the post-church banter between friends and family. Although shaken to the core, once dismissed, the issue of me “talking” was over. I quickly realized this was a lot of emotional energy for absolutely no reason at all. I also remember learning a very powerful lesson, even at that young age, that there are times when it is best to hold my tongue; that fighting to save my reputation in certain situations, and under incapable leaders, is not the best way to handle the situation. Sometimes the best response is no response at all. Let God fight your battles. While this story may seem kind of silly, I have to say that this experience has been one of the best teachers in my life. The memory of the injustice, and how I handled the injustice, is often the first thing that pops in my mind when I am confronted with false accusation and inaccurate judgement of my motives. Even at the tender age of eight I learned the powerful lesson of holding my tongue and using self-restraint when all I want to do is fight for myself. Truthfully, I can’t say I’ve followed this conviction in every single situation throughout my life. The times when I’ve let my flesh rise up when I knew I just needed to be quiet have never, never, worked out well for me in the end. And it has been the memory of sitting in that children’s church room with my name on a board with multiple marks next to it that has been like a cold glass of water in the face. To my credit, however, there have been more times than I can recount where I’ve obeyed that still small voice in my heart that has pulled back the reins on my emotions and has helped me to discern when to speak and when to hold my tongue. And I am so grateful for that. What I didn’t realize as a child, was that God was already teaching me a valuable life lesson as it pertains to authority and God’s sovereignty. I had very little to no respect for the two children who were put in charge of our children’s church group. However, I did have respect for the adults that put them in charge. It was out of the respect for the adults that I was trying so hard to follow their directives. What I struggled to understand was that the adults I respected had given authority to these two inexperienced and immature individuals, and so basically they held an “equal” amount of authority as the adults. Because of this, they were acting on behalf of the true leaders, which made me equally obligated to follow their instruction. Hear me out on this. I am not saying that there is never a time or a place to speak out against injustice and wrong-doing. The answer to every inappropriate action is not to withdraw, hold our tongues and hide. Absolutely not. In situations where physical safety and well-being are in jeopardy then we must certainly speak up and take action. What I am saying is that when we try to right all the wrongs in our own way, with our own methods and in our own time, we often make things worse, and more people get hurt. When we pause and wait for God to lead, for God to work on our behalf and understand that timing plays a critical role in bringing truth to light, then we will find that God fights for us far more successfully than when we try to fight on our own. Colossians reminds us that God is supreme over all things, and that includes thrones, powers, rulers and authorities. There is no leader, whether good or bad, that has the last word. Whatever authority they have has only been given to them by God and for a season of time. Nothing, aside from God’s true supremacy, is eternal. No kingdom, aside from God’s kingdom, will last forever. All things and all beings on earth are fleeting. God’s sovereignty is forever. Pray for discernment from God to know when to speak and when to hold your tongue. When we wait upon God’s leading we can trust that God will make something beautiful out of the mess. When we try to fix it out of our own anger and indignation the mess only gets bigger, uglier and hurtful. There will be a time to speak. God is as angered by injustice as we are. And he will confront it in his time and in his way. And that may mean opening our mouths and speaking at some point. When we are led by the Spirit, then we can trust that our words will be words that will bring light and healing and not more anger and pain. I love this promise. God is before us. God holds us. God is not surprised by the hurt or injustice we face. He is hurt by it too. At the same time, he is holding us together when our hearts start to fall apart, and he is fighting each battle, even when it looks like wrong is winning. God is supreme, and in him all things will work together to accomplish his greatest purposes within us and within each circumstance. When we believe this. When we can hold on tight to the one who is holding us, then we can hold our tongues. We can truly let God fight our battles.